Romeo, Romeo, wherefore art thou Romeo? 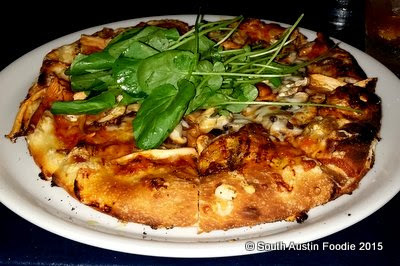 Well, Romeo's on Barton Springs Road bit the dust a long time ago, as did another ill-fated tenant, Umami Mia, but in their place, Juliet has risen off her deathbed. Will she have the stamina to survive? On a recent Thursday night, I met four of my favorite food-loving friends for a girl's night. Only one of us had been to Juliet previously, and all being South Austinites, we were exited to try this newer establishment. Walking in from the parking lot, I really loved how the landscaping and welcoming pathway worked together to lead you to the covered patio where one of our group was already seated. There's a bar and a large dining area, as you almost don't notice that you're right next to the street. Check out their Instagram account for some exterior shots. It took us a while to figure out what we wanted to order, and our waitress was super-patient with us. 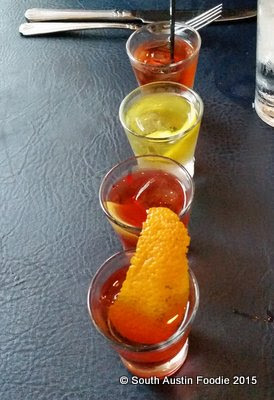 One friend was excited to see a Negroni flight, and she and I decided to split them. These came out quickly, but the two sidecar cocktails took an exceptionally long time to come, and about 10 minutes apart at that. The bar area seemed busy, but not slammed, so I don't know what the hold up was and no explanation was offered. We started with a couple of appetizers. The corn fritter (frittelle de mais) with goat cheese was delicious, very well fried, crunchy on the outside and soft inside. The ceci fritti, or fried garbanzos, had a nice pop of lemon and garlic that made them addictive. And we built our own salumi plate with soppressata and two cheeses, an aged buffalo milk (quadrello di bufala) and younger sheep milk (pecorino fondatore). 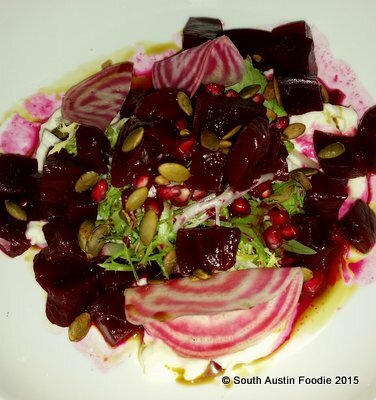 The beet salad was a nice mix of thinly sliced beets and cubed one, with pomegranate seeds adding a nice light tartness and burrata for a creamy balance to the earthy flavors. 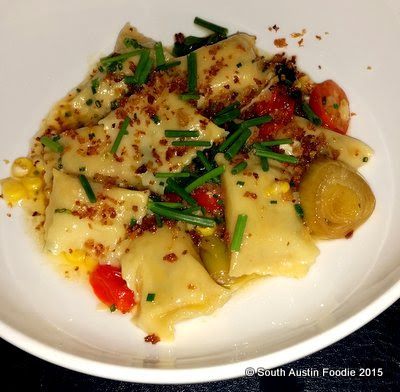 One in our group had the goat cheese agnolotti, ravioli-like pasta pillows filled with goat cheese. The pasta was the perfect texture and had the right amount of pungency from the goat; fresh corn, chives, and tomatoes also added nice flavor. Another person had a pizza, which I didn't try, but she seemed to enjoy it. The main miss for the evening was the carbonara, which three of us ordered. I am a carbonara freak (pig, hello! ), so it's the dish I frequently order when trying out a new Italian restaurant. This lacked in flavor and creaminess, and erred on the side of being a bit grainy, and the spaghetti seemed to be on the border of being overcooked. Juliet's is prepared with guanciale which didn't really seem to add a tremendous amount to the dish, and a Parmesan crisp, which was tasty, but not quite satisfying with the dish. 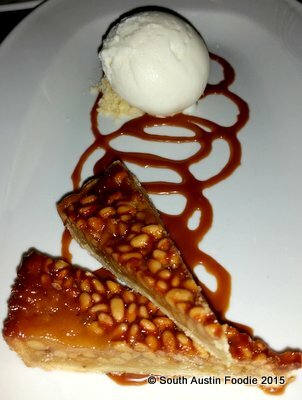 For dessert, we split the pine nut tart (crostata di pignoli) and the torta di ricotta. I really liked the pine nut one, though one person felt the toasted pine nuts were too bitter. 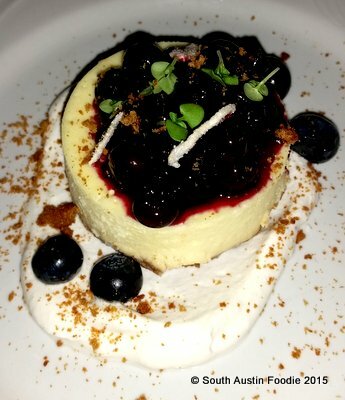 I really disliked the ricotta one, and consensus at the table was that it was off. I know that ricotta is granular, but this seemed exceptionally so, not to mention a mushy ginger crust. The patio lends to a comfortable atmosphere both inside and out. While the outdoors is very light and airy, Juliet's interior is darker, but without being heavy or somber. Our primary server was very good (chatty and knowledgeable), but there seems to be a breakdown of service between the main servers and the runners/waiters in training. I could see the runners going around to other tables with fresh grated Parmesan, but they never approached our table after our main courses came, and I had to flag one down. Also, our water glasses went unfilled/unrefreshed for long periods....like most of the evening. So I want to swoon with love for Juliet, but I am just not quite there yet. The potential is there, but some of the food and service still need some polishing. I still have hopes though for Juliet to rise. We chose most of the same things when we went for our anniversary dinner a few weeks ago, haha! 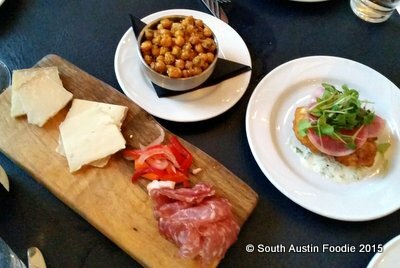 We really liked the beet salad & corn fritters & Andrew loved his Negroni flight. Agreed about the carbonara sadly. And if you mess up a carbonara.... argh! Glad we have the same taste in the corn fritters & beet salad! :) Thanks for reading. Totally agree w/your assessment. 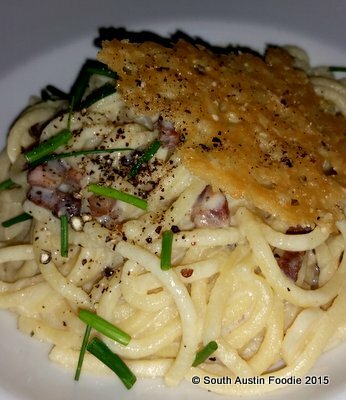 Have you had the carbonara at La Traviata? Life changing! We (and Linda!) need to make a La Traviata date, because you guys keep talking about it!!!! Hi! I read your blog all of the time. Who has your favorite carbonara in town? It is my boyfriend's favorite dish so we are constantly looking for a great one. Thanks for reading, Kimberle! I have always loved the carbonara at Enoteca, but usually get it with tagliatelle rather than spaghetti. My friends LOVE La Traviata's & they swear it's the best. Have you found one you like?